Built-In Wi-Fi® allows you to easily connect to your garage. MyQ Remote LED light can be installed to illuminate any area. Wall-mount design with super quiet DC motor. Powerful heavy-lifting that allows doors that weigh up to 850lbs. 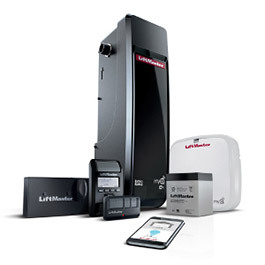 Integrated backup battery gives you access during power outages. Lifetime motor, 5-year parts warranty, and 1-year on battery and accessories.